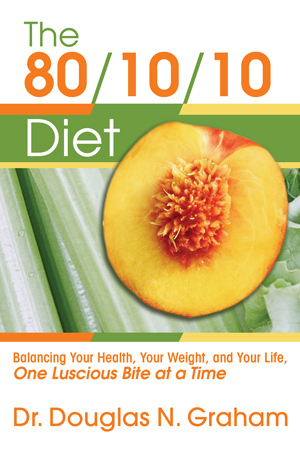 Recently the publisher of Dr. Douglass Graham’s book, The 80/10/10 Diet (80% Carbohydrate / 10% Protein / 10% Fat) sent me a copy with the request to review it. For years I had heard rumblings of the plan and the wild popularity of 80/10/10 forums, but hadn’t had the chance to properly research it and learn the details of the plan. I found the book very interesting. It is Dr. Graham’s contention that it is not natural for humans to eat meat. Put a child in a room with a lamb and a banana. Note which one he plays with and which one he eats. I am sure that many of you have been presented with the biological evidence that humans were not designed to eat meat (our teeth are not sharp enough, our digestive tract is too long, our tongues are not rough, etc. ), so Dr. Graham’s inclusion of that information within the book was not news to me, however much of the 3 pages of Humans vs. Carnivore evidence was evidence I had not yet heard. Dr. Graham believes that humans were designed to eat food in its natural state, food that naturally appeals to humans. When we smell a ripe mango or peach at the peak of freshness, our mouths water…the same does not hold true for the carcass of a freshly killed animal. This leads us to wonder just what humans would eat if they were to find it in nature. According to the example above, it would be food that requires very little (if any) preparation. Our bodies also require simple sugars to function optimally. With all of that in mind, Dr. Graham makes the case that humans were designed to subsist primarily on fruit. According to Dr. Graham we were not designed to eat grass, weeds, leaves, stalks, and stems because we do not secrete the proper enzymes needed to digest these foods. We do however possess what it takes to digest tender leafs and greens. Then comes the subject of starches; grains (grass seeds), roots and tubers, and legumes. Reading Dr. Graham’s book, Grain Damage, has been (and still is) on my “To Do List,” so it was fortunate for me that Dr. Graham touches on his dislike of grains within The 80/10/10 Diet. Starchy roots and tubers grow below ground. Most humans do not salivate at the thought of dirt like animals that grub for tubers do. Many roots and tubers can certainly be eaten raw and I am a fan of raw jicama, carrots, yams, and beets (the naturally sweet roots and tubers), I have a much harder time wanting to eat raw potatoes, parsnips, turnips, and rutabagas. When discussing legumes Dr. Graham states that “legumes in their mature state are indigestible and/or toxic to most mammals.” I was not aware that mature legumes were “toxic” and need to research his assertion further. I do however know from experience that if I do not soak legumes prior to cooking them I experience painful bloating and gas. Even after soaking legumes it is common to experience gas on some level…which makes me wonder if his theory is true. In the book Dr. Graham continues on and discusses his views on other food sources such as fermented foods and dairy along with nuts, seeds, and other high fat plants. I want to quickly mention that within the book Dr. Graham goes into detail about the fact that most raw foodists in his opinion rely on fat heavily in their diet. I share his opinion that most raw food diets are HEAVY in natural plant fats and that aspect of their diet is not healthy and will in fact result in an increase in one’s body fat percentage which is generally undesirable…most people want to reduce their body fat, not increase it. Since reading The 80/10/10 Diet I have attempted to avoid grains and have been really happy with the results. After eliminating grains for 2 weeks I had some rice with dinner and experienced painful bloating within 20-30 minutes. I was shocked by how quickly my body reacted to eating brown rice. Since I tend to see my body as an experiment of sorts and I am always trying to find the ultimate formula for it to run as efficiently as possible, I am interested in trying the 80/10/10 Diet. My hesitation in doing so is that this diet is so different than that of my immediate family. I enjoy “sharing” meals with them and fear that eating the 80/10/10 way would diverge from their meals so drastically. While Dr. Graham suggests that people give the 80/10/10 diet a 1 year trial, I plan on starting by giving it a shorter trial when my children go to visit their Auntie. I am interested in seeing the results. If I like the results then I am confident I can follow the plan for breakfast and lunch (which I have been doing for the most part since reading the book) with some modifications to my dinner meal. I will most definitely report back with the results. I have read many accounts of the diet’s followers improving their athletic performance and recovery and I can’t wait to see if I share their experience athletically. Dr. Graham is a specimen of athletic ability and he is not a kid anymore (he will be 60 in March 2013)!!! Along the same lines this diet is purported to help lower body fat percentage while maintaining lean muscle mass. Since eating the 80/10/10 diet for breakfast and lunch my personal body fat percentage has dropped 2%. I will of course track my body fat percentage when I do the 80/10/10 Diet one week trial. In theory Dr. Graham’s book makes sense to me. I am excited to put the plan into practice…even if it is for only one week. While Dr. Graham is a believer in raw foods, with my thyroid issues, any cruciferous vegetables that I eat will be cooked. Have any of you attempted eating this way? If it is a consideration for you, I recommend reading the book because it goes into great detail about the plan, provides sample meals, recipes, and other necessary resources. Click HERE to read Dr. Graham’s interview with Chic Vegan. This is very interesting! I haven’t heard of the 80/10/10 diet, am intrigued. I recently completed a modified juice “reboot” which claimed to be 80/20 (veggies/fruit) but the “chewing” recipes did contain some olive oil so I’m thinking it was closer to this ratio. Eliminating my beloved grains from my diet was tough but after a couple of days I felt so much better! The bloating and stomach pains that had formerly plagued me were gone! I’m going to read this book, and follow your progress, thanks so much for sharing! No problem! I enjoy trying out new things and look forward to seeing how this week progresses. Dr. Fuhrman says he has treated countless patients on that diet who develop dental problems or eventually lose their teeth from eating that much fruit. Unless perhaps one lived in the tropics, fruit was not available all year round or in that great of quantity to our ancestors, if you truly want to know what our ancestors ate throughout most of human history, read the book recommended by Dr. Doug Lisle called “Catching Fire”. It certainly wasn’t fruit.. Fruit is healthy and delicious and we should eat a lot of it, but 20 bananas a day? Really? People can avoid grains if they like, but vegetables? I think people can be just as slim and healthy by avoiding processed and packaged foods like sugars and flours. The fruit we eat today ihas been hybridized and is exceedingly sweet, it is not the same fruit that was eaten by our ancestors. I do not see any scientific data that proves that this is our natural diet or even a healthful one for most people. Thanks for the book recommendation AJ…I am definitely a fan of Dr. Lisle, so I look forward to checking out his book. This should be an interesting experiment for a week (not sure I could EVER get myself to eat 20 bananas in a day though!!!). Chef AJ, Have you read The 80/10/10 Diet? * Anyone who neglects vegetables when eating 80/10/10 isn’t following the 80/10/10 recommendations. * The people experiencing teeth problems turn out to be neglecting oral hygiene, thinking that it is more natural to just rinse with water. With sensible flossing and brushing to keep the teeth and gums clean at least daily, the oral hygiene issues go away. Fruit isn’t the problem, it is the scapegoat. So perhaps you should reconsider the health effect of 20 bananas a day as it seems you’ve never experienced it. Most westerners can’t eat more than 1-2 bananas because they eat them starchy and unripe, before they get their black spots. Dr.Fuhrman has the data but you have to be a member of his website to see his posts, it has to do ith having so much sugar contiained in the high Amount of one of the fruit that is consumed, if you attend the Heslthy Lifestyle Expo this year you can ak him personally. Even people with good dentl hygiene cn get their teeth ruined or discolored by things in their diet like coffee for example. I am going to be at the Healthy Lifestyle Expo again this year…excited to see you there. I just saw the speaker line-up and am SO EXCITED!!! Such a great event. – because they don’t follow the recommendations in The 80/10/10 Diet and get low on minerals by just eating fruit and excluding vegetables and leafy greens. Also, not getting sufficient sunlight and going low on vitamin D affects calcium metabolism which can contribute to teeth and bone issues among other problems. Thanks! If the diet works for you that is awesome. I am a member if the Fuhrman forums where many people came from that diet because they had dental problems and are now nutritarian. Bananas are not even grown here so it would not have been our natural diet in the states. I think fruit is awesome, but that veggies are awesomer! But what I like about 80/10/10 is that it is UNPROCESSED and low fat. The typical raw diet is not. I was raw for 2 years and did not thrive. Beans really help me as do cooked greens. I eat about 2/3 of my food raw. Looking forward to your findings! Sugar and grains seem to be the hardest for me to eliminate- obvi relation. I’m really looking forward to reading your findings! Very interesting! The diet does seem pretty high in fruit (and fructose) and a little lacking in vegetables, but I can see how one might feel better when eliminating grains and legumes. I’m really interested in hearing the results of your trial! The 80/10/10 diet recommends almost as much volume of vegetables and leafy greens as fruit, with 3-5% of total calories coming from leafy greens. As leafy greens are so low in calories (while high in minerals and other nutrients), 3-5% of total calories is several heads of lettuce a day. The 80/10/10 Diet very likely recommends more leafy greens than any other diet. That’s a good point Kevin…fruit is much more calorically dense food source than greens, so it stands to reason that you would still have to eat a large volume of it.